The Early Help for Mental Health service is now available. Virgin Care, Young Devon and Kooth/Xenzone work in partnership with a collaborative approach that allows these EH4MH partners to provide far reaching support to children, young people and school staff. Their aim is to contribute to our county’s children and young people developing and sustaining positive mental health. Positive mental health is the foundation on which we as individuals, can live healthier lives. 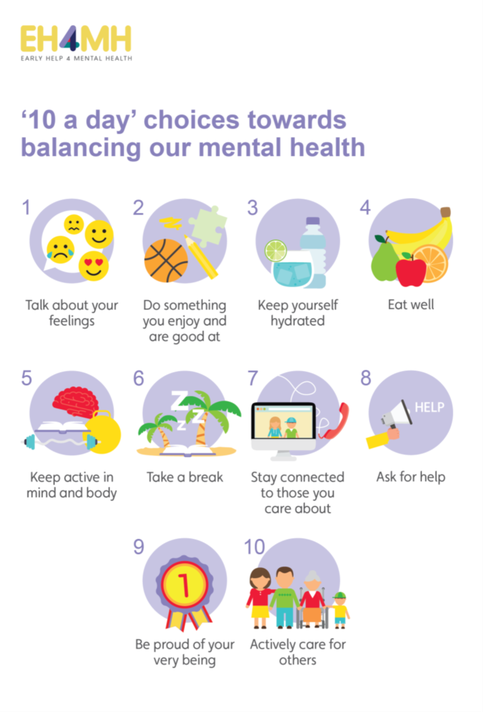 With positive mental health we are more likely to be motivated and engaged in our learning, realise and achieve our potential, choose healthier lifestyles, engage in all the world has to offer, shout out when abuse is occurring, seek help when times are tough and recover a sense of wellbeing and achievement following traumatic experiences. Please find some helpful links to websites below for more information on the services you can access for your child. Emotional and Mental Health in Children A website for parents and carers. Reliable and up-to-date resources on emotional and mental health for your children. Kooth Kooth, from XenZone, is an online counselling and well being platform for children and young people. Young Devon This website provides details of some of the services you can access for your child in Devon. Childline This website contains lots of useful tips and advice on everything from internet safety to coping with different emotions.